I could go into a long and detailed explanation about how I was inspired to experiment with some different spices after buying a small tub of pink peppercorns...but let's be real, I just wanted an excuse to bake brownies. 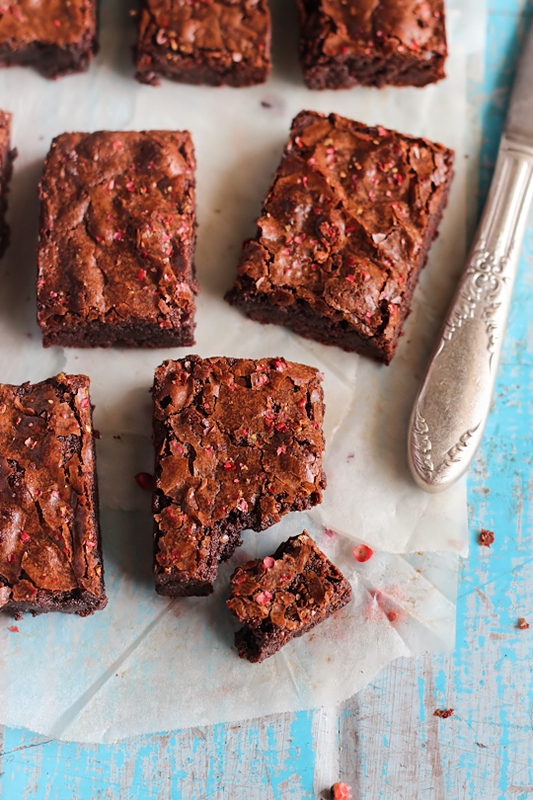 Perfectly fudgy chocolate brownies with that wonderful crackly layer on top. At the moment my baking schedule is completely determined by whatever naughty sweet treat I've been fantasising about while eating my tuna salad lunches. I needed the brownies. But I really was eager to try out the pink peppercorns with a dessert of some sort. 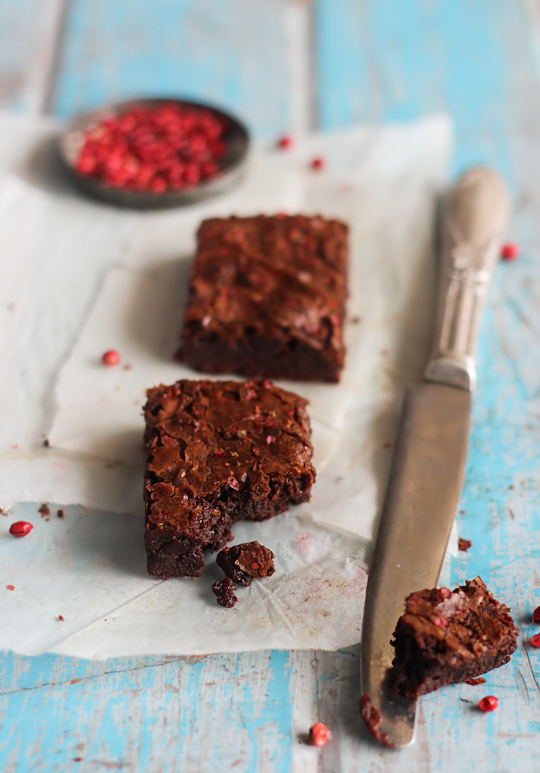 I already love using black pepper in desserts, and yes I know that pink peppercorns are not technically peppercorns but they have that great peppery flavour and a vibrant pink colour, which I think looks fantastic sprinkled on top of the dark chocolate brownies. This recipe is essentially a twist on the spiced blondies I made a few months ago (one of my favourite recent creations). I used the pink peppercorns, with a bit of real vanilla bean, cinnamon, cloves and cardamom. 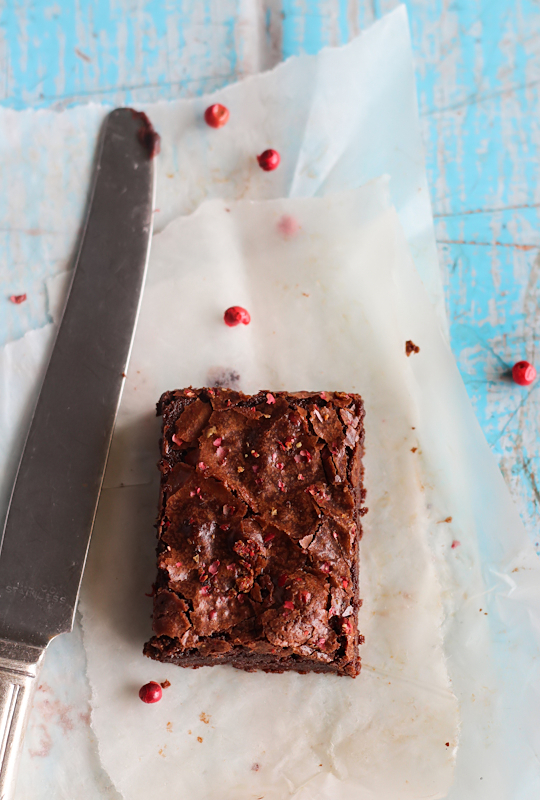 It's fun to try out if you want something different to the regular brownie, and the colour of the pink peppercorns on top make it pretty enough for some Valentine's Day baking. Recently I've struggled with over-baked, cakey, dry brownies that are missing the ideal crackly top and chewy edges. This time I decided to base this recipe on David Lebovitz's recipe from his book Ready for Dessert: My Best Recipes, available online at Babble. Dear David, you are so awesome. Never change. I will definitely be using this recipe again, it made the prettiest, fudgiest, chewy brownies ever. Oh, and if the idea of using pink peppercorns freaks you out too much just replace it with freeze-dried raspberries or something. Preheat the oven to 180°C (350°F), I'd recommend lowering it to 170°C if using fan-forced. 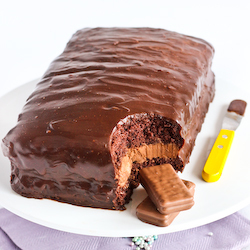 Grease well and line the bottom and two long sides of a 20x30cm slice/brownie tin (can be substituted with a 20cm/23cm square cake tin). Let the baking paper hang over the long edges, it will make it easier to lift brownie out later. Grease the paper lightly as well. In a medium saucepan, melt the butter, then add the chocolate and stir over low heat until the chocolate is melted and smooth. Remove from the heat and stir in the sugar, cinnamon, cardamom, cloves and vanilla bean until combined. Stir in the eggs one at a time until smooth. Add the flour and stir energetically for just a minute, until the batter loses its graininess, becomes smooth and glossy, and pulls away a bit from the sides of the saucepan. Scrape the mixture into the prepared pan. Sprinkle pink peppercorns evenly over the top of the mixture and then bake until the center feels almost set, about 27-30 minutes. Don’t overbake. Let cool completely in the pan before lifting out the brownies using the baking paper overhang. Slice into 16 equal pieces. Store in in airtight container (I kept mine in the fridge to keep it from going soggy), can be stored for 4 days or frozen for up to a month. spiced baked goods are my jaaaam, thank you for this! 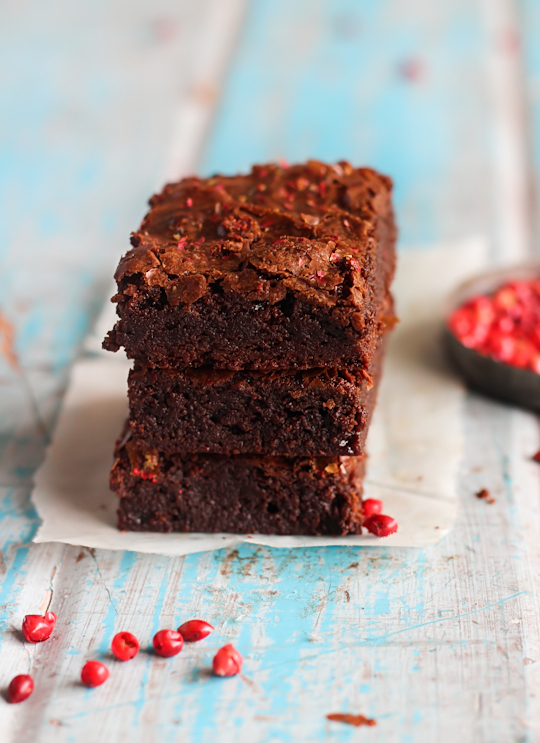 brownies are such a versatile thing, aren't they? and david lebovitz is a baking god. Love the pink peppercorns! Makes me want to go out and buy some. Mmm...I love the idea of this combination, especially because every time I eat pink peppercorn, I am brought back to the first moment I tried it. I was on the beach in Nice on a perfect spring afternoon eating a gelato cone with a unique rose & pink peppercorn gelato. Thanks for reminding me of that memory again on this chilly January night! David Lebovitz's recipe is awesome - it's my go-to brownie recipe although I sometimes add a little bit more butter. Love the idea of pink peppercorns on top and so pretty! Oh man I love that recipe (though I still use others recipes too - so many brownies, so little time)! Pink peppercorns are great - I make a strawberry and pink peppercorn ice cream that's awesome. Bet they're good with chocolate too. These are such a new take on the brownie. I think the peppercorn works like chili in chocolate but milder. The colour contrasts is fantastic, much more interesting that normal red fruits. I think these are the most gorgeous brownies I have ever seen. Seriously gorgeous, and I bet they are pretty tasty too. 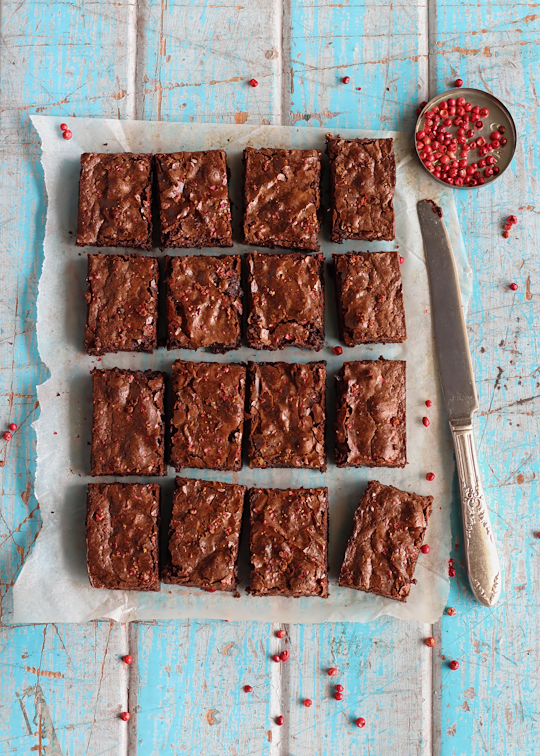 Brownies are very hard to go wrong by but I love what you have done with the spices and pink peppercorns - definitely something different. They look and sound fantastic! These look amazing! I love brownies and have been looking for the perfect recipe for such a long time without success. 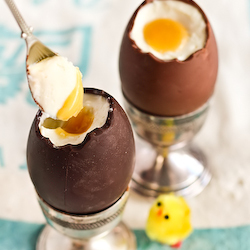 I'm definitely going to give these a try - David Lebovitz recipes always work! And the spices sound like a spectacular addition too. Yum! Thanks for these Steph. I had kind of lost faith in brownies, getting tired of the same old flavors all the time. I don't know if I can find pink peppercorns where I live, but now I have a reason to try! BTW, your pink funfetti? 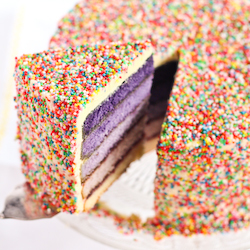 sprinkle cake from 3 weeks ago was one of the most beautiful things I've ever seen. The second I get a kitchenaid I'm going to try it out... buttercream just doesn't seem possible by hand. I loved the sprinkles you chose too, it's impossible to find things like that where I live, the whole specialty baking revolution hasn't quite gotten here yet. 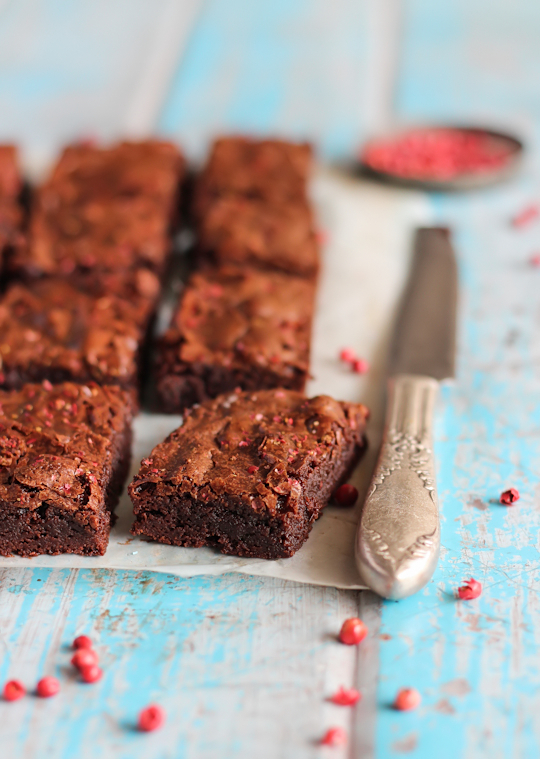 I really love your unique take on the brownies with the pink peppercorns. They make them look so pretty yet fiery! this looks amazing! 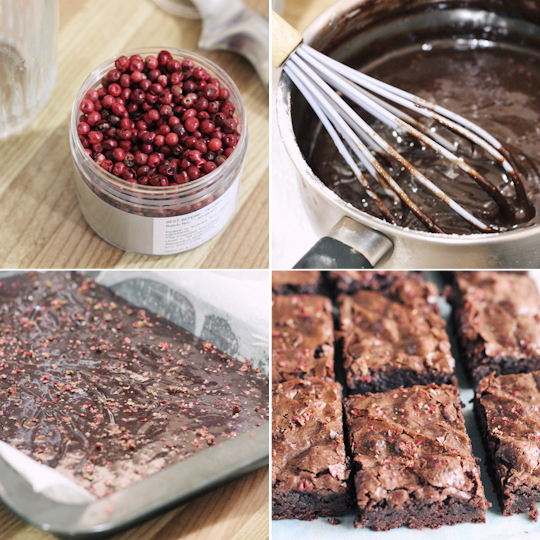 pink peppercorns are so good, i would never have thought to put them in brownies. beautiful photos, as usual, i love the contrast with the table! Mmm these look so so tasty. 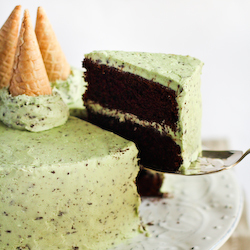 The crunchy sugary top looks perfect. I didn't realise you could eat pink peppercorns. I mean, I'm assuming they're the same ones as on our peppercorn tree but for some reason I thought they were inedible... either way, though, I like the idea of adding them to brownies. Kind of like chilli chocolate, but different. Pink peppercorns!! Where would I find that here in Spain.. what a combination..!! Love it! !